Following the launch of Fox-1Cliff/AO-95 AMSAT Engineering began the commissioning process, with the help of AMSAT Operations, on Tuesday, December 4. Satellite telemetry indicates that the bird is healthy, and I thank all of the stations who have captured and relayed the telemetry that enabled us to monitor and determine the health of the various systems on board. Fox-1Cliff required an extended period monitoring battery and power levels due to the anomaly and fix that was applied back in February of 2016 during environmental testing, and the result of that is positive. 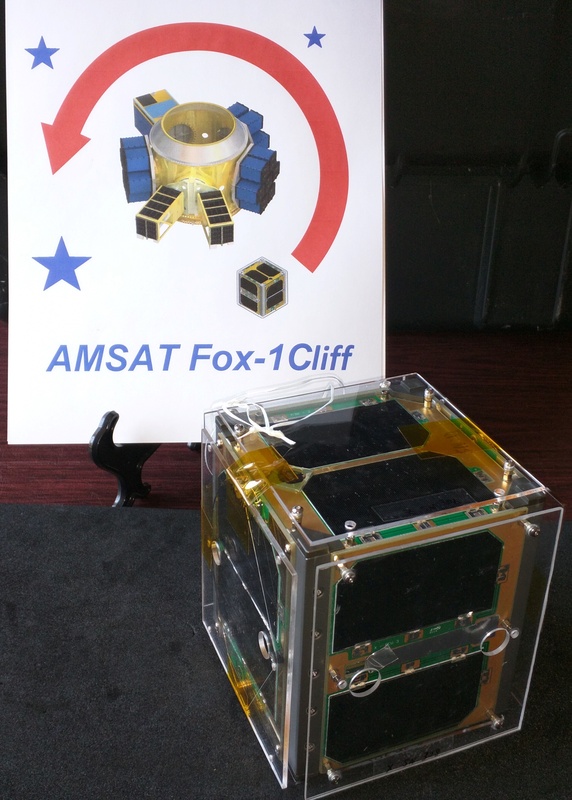 AMSAT is counting down to the launch of the next Fox-1 satellite, Fox-1Cliff. The launch of Spaceflight’s SSO-A SmallSat Express mission, on a SpaceX Falcon 9 from Vandenberg Air Force Base is scheduled for 18:31:47 GMT on Monday, December 3. Fox-1Cliff carries the Fox-1 U/v FM repeater, AMSAT’s L-Band Downshifter, the flight spare of the AO-85 Vanderbilt University Low Energy Proton (LEP) radiation experiment, and the standard Fox-1 Penn State University–Erie MEMS gyroscope experiment. Virginia Tech provided a VGA camera which is the same as AO-92’s but will provide images at a higher 640 x 480 resolution. Additional information about the launch and early operations phase (LEOP) will be released prior to launch. available with purchases completed online, and for only a limited time. A perennial favorite, Getting Started is updated every year with the latest amateur satellite information, and is the premier primer of satellite operation. The 186 page book is presented in PDF format, in full color, and covers all aspects of making your first contacts on a ham radio satellite. Please take advantage of this offer today by visiting the AMSAT store at https://www.amsat.org/shop/ and selecting any membership option. While there, check out AMSAT’s other items, including the M2 LEOpack antenna system, Arrow antennas, AMSAT shirts, and other swag. Be sure to view your cart before going to checkout. If you add a membership and then go directly to checkout, you’ll never see an option to add your free gift.